Hello to all. Before starting the chronicle, we must already know that Im Dunkeln is not a group, but the name of the sole member of this Black Ambiant project. As its name does not indicate not at all, the man behind this project is ... Italian. And yes, like what, German is really the language of the black metal. That's made a little cliché anyway, but let's move on this detail. 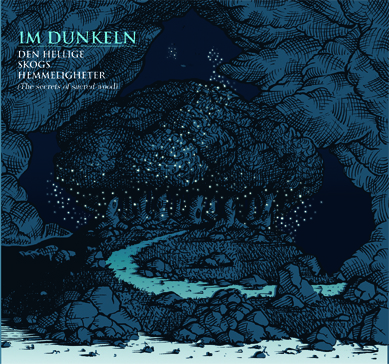 This Den Hellige Skogs Hemmeligheter is the second album of Im Dunkeln, in the same year. A colt supported by "Alchemic Sound Museum" tooth and nail since his begining, and produced by this same French label. We thus find fourteen tracks in less than a year. Having discovered this band with this album, I couldn't make a comparison with the previous one. The fact is that this music is not the most accessible because it is very rich, varied and complex. Let me explain. The tracks have two distincts passage: atmospheric and black metal (relatively speaking, we are far from a violent black metal) with a vivid voice flayed. These (rare) vocal passages present are very disturbing but also terribly addictive. We dread as much as we expect this voice who seems to be full of pain, screams and heartbreak. But besides of that, some tracks will be more aerial, transporting us to the image of a Fading Waves (for a completely different style) far in other spheres. This mix between black metal and classic black ambient is very well composed. Moreover titles even if they keep coming perfectly together, show a great diversity. The album could even get close to music as those present on Filosofem Burzum. You know, like that famous title with there three-note for almost half an hour that could sleep an army of Ravers under ecstasy. The only difference is that the title who may be more closer of this track is three times less long and is far more mastered, really helping to transport the listener. The advantage of this album is that is so rich that each listen will give you a different feel. Just like each of the securities which, forming a coherent whole, give us a different world each time. To the very quiet and ambient "Øyenstikkerens Ofring" who dives the listener into a world very introspective, to the very varied "Albinoravnens Ensomhet" which mixes soft parts (may even resemble to the work of Danny Elfman on Burton's films) to the more brutal thanks to its most violent parts of batteries. This second opus of Im Dunkeln is a complete success despite difficulty in appropriating it. An album that contains a lot of faces who may also well be taken as a bedside album or an album to listen more strongly in his living room with a good book or evening. An album that will never tire of listening to a time when we will have all the cards in order to fully enjoy it. Without moderation.